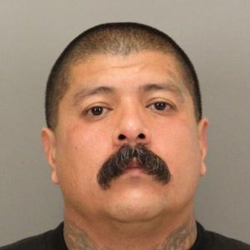 Albert Manuel Vasquez, 42, was shot and killed by police Thanksgiving Day after reportedly stabbing three people and then carjacking someone in East San Jose that morning, according to the San Jose Police Department. Vasquez was suspected in a triple stabbing at an apartment complex in the 2100 block of Luz Avenue about 10:30 a.m. Thursday. According to witnesses, the aftermath of the attack was a chaotic scene, which included the victims — two men and a woman — emerging from an apartment into a common courtyard bleeding from their wounds. From there, Vasquez reportedly ran east to North Jackson Avenue, where he assaulted a minivan driver and commandeered the vehicle. He was quickly spotted by Officer Kevin Peters, a 12-year police veteran, who tried to stop the van, which led a chase that briefly went the wrong way on Interstate 680 before re-emerging on city streets, still traveling at freeway speed, ending up on Mabury Road near North White Road. The van turned into a cul-de-sac on Kirk Glen Drive, where Peters blocked his path. That’s when police say Vasquez rammed the van into the patrol car, prompting Peters to fire his service pistol, hitting Vasquez, who then drove the van into a home across the street. Vasquez was pronounced dead at the scene.